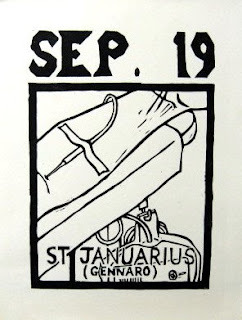 I went back to the Studio today to print the new Januarius block. The image has a lot of empty white area, which can make it difficult to ink- my brayer tended to put a lot of ink into those broad empty areas where it was unwanted. There's a simple fix for this, masking tape, but I needed to put down a lot of it today, as you can see in the image of the inked block. But it worked. I printed two proofs (bottom image), and left them in my rack to dry. So far, so good. Maybe I'll start the coloring later this week. In the afternoon I went up to the Studio. It seems like forever since I was in there to make art. 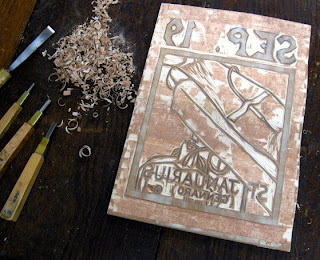 Now that the Januarius block was back from the gallery, I could finally finish cutting it. Didn't take that long. I'll save the printing for tomorrow or Monday. A few other things while I was there. I took advantage of the sunny weather to take a walk and see the new show at Crybaby Gallery in Asbury. 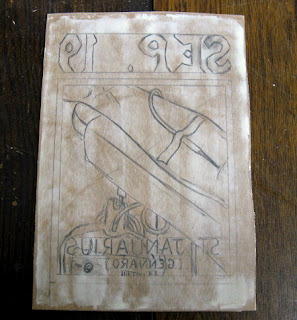 It included some wood skateboard decks that were cut like woodcut relief blocks. Looking at the level of detail and precise cutting, I figured these were not done with hand tools, and the gallery confirmed that these were laser cut. A machine product, but still a nice effect. Just as I was setting up to print a few student blocks, I had some visitors- Kelly Connolly (from the Belmar 4 person show) and her boyfriend had wandered into the building and found their way down to the basement. So I gave them a tour of the facilities and answered their questions about printmaking and the building. And I printed those student blocks. It was a good afternoon. Today I got up earlier than I generally like to on a Saturday, but I had a reason- I had to take down my solo show at Georgian Court at 9:00 a.m. 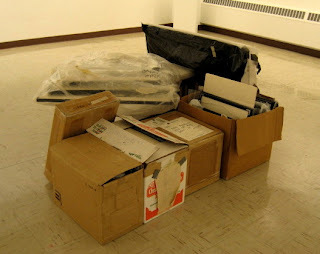 It took me 2 trips to bring all the boxes and wrappings from my truck to the gallery, then I began the process of carefully but quickly packing all the work. About 3o minutes later, all 51 pieces were ready to go, as seen here. My binder, handouts, statement, and sample block were also all packed. I brought one load down the stairs to my truck in the parking lot, then moved it closer to the door by the other end of the building so we could use the elevator and cart to move the now filled boxes to my vehicle. Out in plenty of time for the next show to start installing. All things considered, I think the show was a success. It got a very good response from those who saw it, and probably gave the print students exposure to a way of working they haven't seen before. No sales, but I have had some people express an interest in buying some of my work, so that could change. Had a busy morning today. I had plans to meet with one of the adjucnts from my University at the gallery in Lakewood, followed by a tour of the Studio. That all went as planned, with my friend and her two friends all impressed with both my exhibition and the building where the Studio is located. Unexpected was that while we were in the gallery, a man saw me and introduced himself. He's a part time sculpture instructor there at the college, but many years ago he was a teacher in Neptune, and taught in the very space the Studio now occupies. At that point the building was being used as a grammar school. Molly and I have always wondered exactly what the room was for originally- the odd concrete platforms, concrete floor with a drain. (the above photos show how the room looked before we moved in and fixed it up) One door says "Boys" on it, but the layout and existing plumbing don't seem right for a lavatory. (I thought maybe a locker room, or more likely, a door salvaged from elsewhere in the building). What I was told today was the room had a variety of functions toward the end of the building's life as a school. 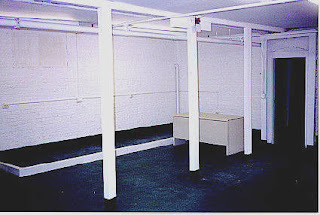 A general utility room, it was sometimes used for arts and crafts, sometimes for storage, or even as a maintenance closet. I like that the space had been used for art before, like we are continuing a tradition. For the first time since I started teaching at two schools, both have the same spring break week. Some might take advantage of this to go on a vacation somewhere. Me, I picked up some days at my sub job, and the past couple of days have been grading papers and watching the first round of the NCAA basketball tournament. (Under other circumstances I might have put in some time in the Studio, but my lastest block in progress is in the gallery for another week, and I have no other idea ready to go.) So far I'm about halfway through the grading process, and in the first day of action, I'm 13-3 with my picks. Not great, but good, and my whole sweet 16 is still intact. Each year I like to see how many of the 65 schools are colleges that have some past relationship with. This year it's only 3- Villanova (1 group exhibition) Texas (1 group exhibition), and Texas-Arlington (2 group exhibitions and a week as a visiting artist). I could maybe throw in Miami as a 4th; I was in a group exhibition that was part of the SGC conference being hosted by the school, but the exhibition itself was off campus. The best ever that I'm aware of was 2006, when I had 7 related schools- Villanova and Texas again, as well as Southern Illinois (attended), Northern Iowa (group exhibition and journal publication) and Illinois, Syracuse, and Louisiana State (all group exhibitions). SIU and Syracuse are in the NIT this year, but it's not the same. St Joseph's Day has come around again, and so once more Studio Arrabbiata celebrates this important holiday. I had originally considered having an employee holiday party at the Studio, but Molly had to postpone the Open Studio night she had been planning. Instead, I brought in a bunch of the special pastries to my day job, where they were much appreciated. 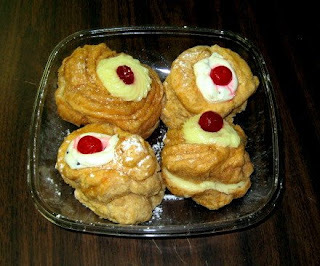 Most common are the zeppole, sliced and filled with custard (yellow). I prefer the sfinge, filled with cannoli cream (white). I brought both types. Preferences around the office were evenly divided, so they all disappeared. Then last week I was at my sub job, and someone mentioned just seeing me in the paper, and congratulated me on winning an award. I knew that an article about the then upcoming BAC juried show had been due out the previous week (I had given a few quotes for it, but not yet seen the published piece), but was confused about the award comment. Had I won another award this year? She elaborated by saying there was a picture of me in front of an artwork. That made me realize the photo was from last year's show. The reporter had asked for a description of my prize winning piece from last year, and I mentioned that it had been featured in the article last summer, thinking she could easily find that photo. Instead, she got hold of this other one. This was another one of those small weekly sections. At my sub job again this morning, a co-worker asked me if that was me in the paper, referring to this article, which I confirmed. Then late in the day I was at the main building, where the secretary handed me this copy (Lifestyle/right side) that she had been saving for me, my first time seeing it. 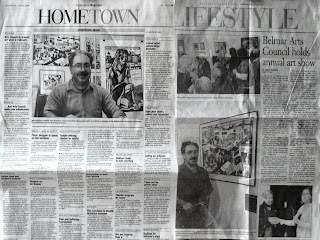 So, twice within 6 weeks there were two large file photos of me published in local community weeklies showing me with my art. Since both relate to shows at the Belmar Arts Council, I would think that they were both distributed in the same area. Whether or not anyone remembered the first photo when the second one came out I don't know, but if so, they might wonder why I deserve so much coverage. I don't want the public getting sick of me too soon, because I plan to be making and showing art for a long time to come. Didn't do anything new to the block, just brought it down to Lakewood on my way to my evening class. I had thought that it would be put (on a little table easel) on the table with the statement, handouts, and sign in book, but it was suggested instead to put it on one of the pedestals around the gallery. It now sits on one in a corner, just a few feet away from the framed saints. 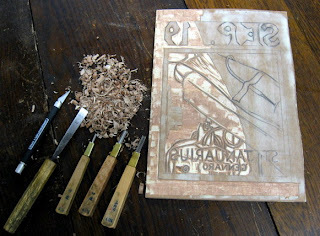 For the next two and half weeks, all those who come through the gallery can see how a woodcut block and print are made. While at the opening in Lakewood last week, my father came up with an idea that he shared with some of the faculty at the school, who liked the idea. Then, with everyone in favor of it, he told me about it. The idea was to bring in one of my wood blocks to put on display, so visitors who are unfamiliar with the process can see how it works. However, leaving an uncancelled block just sitting out, especially one that I haven't finished editioning, seems like a bad idea. But there is something to the idea of having something physical for viewers to see. So I came up with an alternate plan- a new block. The easiest thing for me to put together on short notice is a new saint. I had done some research on a few, but the one that was ready to go in my mind was St Januarius, commonly known to Italians as San Gennaro. He was brought to my attention by someone who purchased one of my mini-saints and inquired about having one of this saint. That may yet come, but I decided that for now I'd do a full size one, and can always do a small version later if it works well. Besides, I'd rather have a full size saint block to go with full size saints in the gallery. As for the story- the biography in Butler's is all pretty standard stuff, common enough to most martyrs, and no stories that I haven't done earlier in the series. However, the thing that San Gennaro is most famous for now is something that happened after his death- a church in Naples has an alleged relic of his blood, which miraculously reliquifies on those ceremonial occasions that it is brought out on display. The blood story seemed the way to go. What I came up with was the idea of blood donation, complete with the bag of collected blood. I'd done an image of giving blood once before, part of the Fourth of July series, but this one will be larger and in color. I've donated blood many times myself, but took the time to check some online references and made some quick sketches. Some of these were absorbed into the drawing that I eventually did on the block. After that, I began cutting. Usually I start by cutting out the whole border, then the date at the top, then the main image section. This time I decided to cut literally half the block, so viewers can see how the block goes from drawing to cutting. I'll leave it at this state for now, with plans to drop it off at the gallery on my way to one of my workdays in Ocean County this coming week. The first photo shows the original drawing- the arm with the needle stands out best right now. The blood collection bag may be harder to discern, intertwined with the saint name, but color will help clarify the shapes in the final print. The second photo shows the day's progress, left side cut, right side not. Nasty rain moved into the area yesterday and today, but not enough to slow down today's opening reception at the Boatworks. 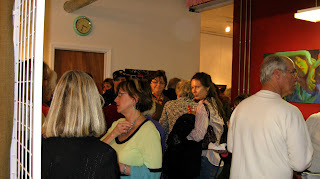 Our cozy building was just about bursting at the seams with visitors- many of the 91 artists were in attendance, along with those who accompanied them, as well as local art lovers. A very diverse group of artworks were selected by juror Doug Ferrari of SICA- mostly paintings, but also many drawings and photos, and assorted mixed media, collages, sculptures, and even a few traditional prints. The four top awards will share a show like we had last month, and 13 other artworks were chosen to be the cover and 12 months of the 2009 BAC calendar. The show will remain on display through April 5, 2008. There are open gallery hours on Fridays 6 to 8 pm, and Saturdays and Sundays 2 to 6 pm (except Easter), and whenever else anything is going on in the building. Today was the day that we were to learn the result of the jurying of the upcoming 4th Annual Juried show at the Belmar Arts Council. I didn't get the promised e-mail, but I assumed that they wouldn't take more than one piece per artist, so I needed to stop by no matter what was decided. When I arrived, I found that the above piece, Scenes from the Grand Opening #20, will be part of the show. There was no guarantee- over 240 pieces were submitted for jurying, so quite a bit had to be cut. The back room was curtained off for the moment, but from what I saw hanging in the front room (where mine was on a wall), this will be a very diverse show. 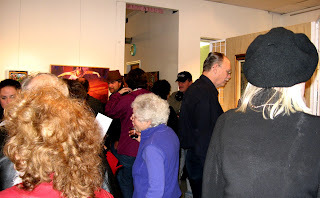 The reception is this Saturday, March 8, from 3:00 to 5:00 pm at the Boatworks. One new thing today- they've installed a new hanging system in the front room. These are flexible heavy wires that hang from moldings mounted at the tops of the walls, down to about 3 feet off the ground. Adjustable clips slide onto the wires (can be multiple clips to double hang like I did with solid hangers at Georgian Court), and the extra wire can be coiled up and hidden behind the framed works. The nails I put in the wall for my show there last month were the last to ever go into those walls. Last night was the opening reception for my current solo show at the M. Christina Geis Gallery at Georgian Court University. It was a little quieter than expected, probably because Monday is a slow day in the department. I estimate between 30 and 40 total people came through the gallery, most of those students from the few classes going on. Those who did come got to enjoy some tasty food (once we found it- it had been delivered to the wrong location first) and of course, the art. Most popular were the new tower print, my September 11 print, and a few individual supermarkets and Ecclesiastes prints. Also many positive general comments regarding my use of color and the titles of the works. Lots more students will be around the building in the coming days and weeks, so the work will be seen by many more people. I hope they all enjoy it, get excited about printmaking (especially woodcuts), and maybe inspired to try some interesting and unusual subjects in their own work. 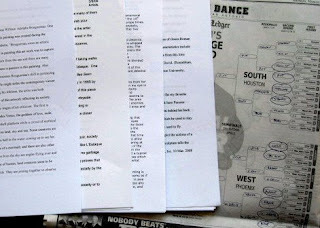 I've devoted much time over the past month to tasks related to my upcoming solo show at Georgian Court University. Paperwork, making postcards, finishing artwork, framing prints, etc, often working late into the evening. But today it paid off. Predictions of bad weather proved false, allowing me to safely load my truck and bring all the work into the Art building on campus. With help from faculty and a student, the work was laid out like I planned, and the hanging system made for a speedy installation. The whole thing was pretty much up in 2 hours. I had eliminated 2 prints from the initial list I had provided, bringing a total of 51 framed works to the gallery, and all ended up being in the show. 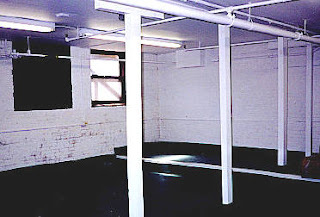 The photos show the four corners of the gallery. From top to bottom- the 22 prints of the Ecclesiastes series, my 3 large prints and some supermarkets, more supermarkets and some saints, and assorted medium small works. 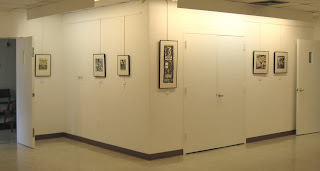 There are also 3 medium-large black and white works in the little alcove in the hall just outside the gallery doors. All the people from the school were very happy with how it looks, and we are anticipating a good response from the rest of the student body and faculty when they see it next week. 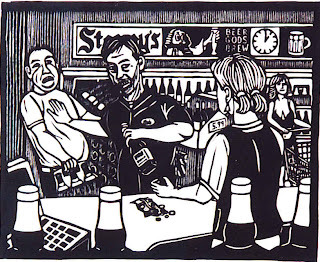 Idle Hands opens with a reception on Monday March 3, from 5-7 pm (despite what was printed in the Star-Ledger), and will be on display weekdays through March 28. For details call the gallery at (732) 987-2388 or see the Georgian Court website.